Looking for something to keep the kiddos busy? This list of heart crafts for kids has some great ideas. Almost one month down, y’all! If you feel like January just flew by (like I do), slow down a little bit in February, sit down with your children and make some of these adorable heart crafts for kids. I’ve compiled a list of 20+ crafts perfect for varying age groups. Simple Heart Craft for Toddlers // Talk about a cheap craft, y’all. You probably already have everything you need to make this fun little heart craft at home already — coffee filters, scissors, markers, and string is all it takes! 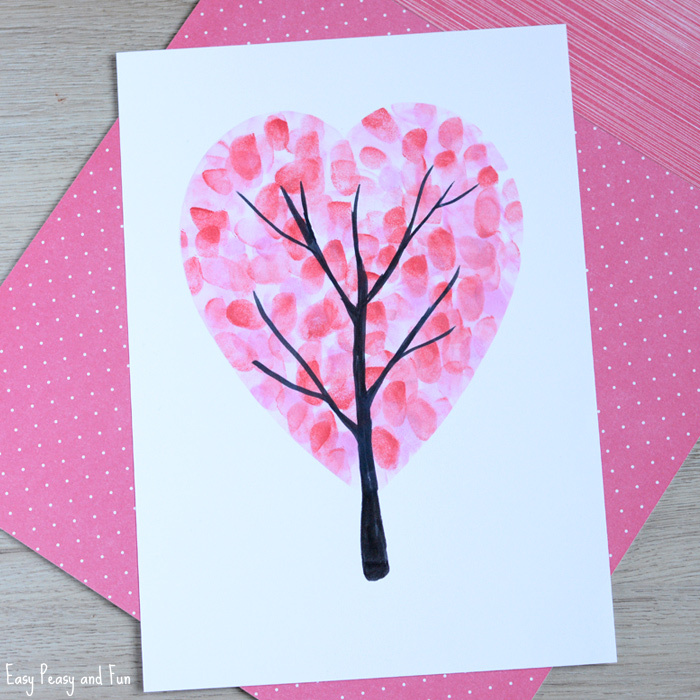 Valentine’s Day Heart Fingerprint Craft // Have your child create a masterpiece using their cute, little fingerprints. Use paint, a stamp pad, markers, etc. and make this festive little tree. How adorable are these? 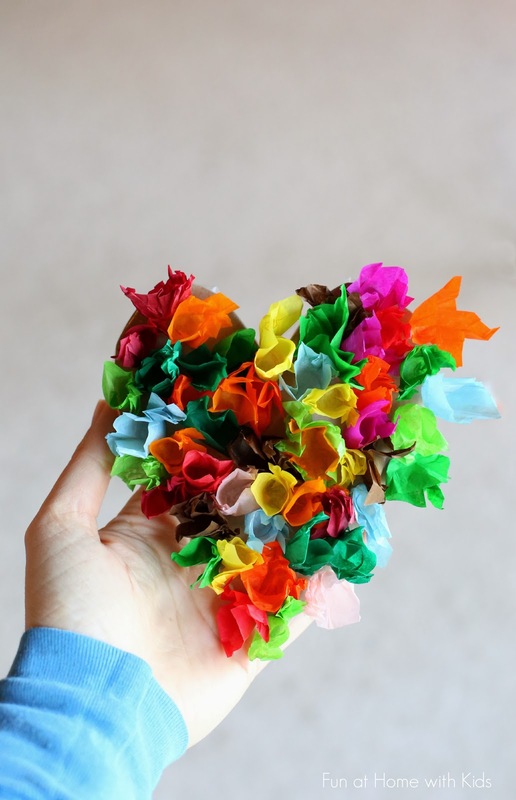 Tissue Paper Heart Craft for Kids // Get out your colored tissue paper and make an adorable, colorful heart – perfect for displaying during the holiday of love! Crystal Hearts Valentine’s Day Science // If you have a little scientist on your hands, these little Crystal hearts will be a lot of fun. It’s a great way to include craft time and learning time together. 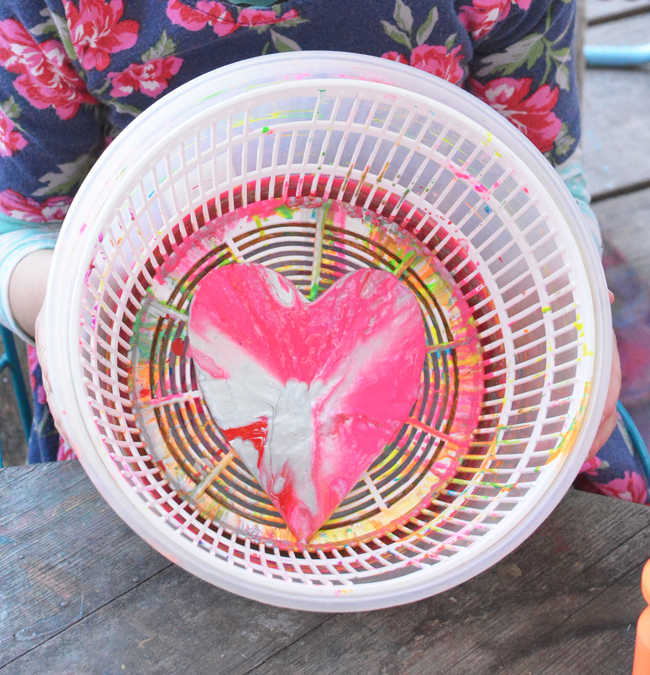 Spin Art Hearts: No Mess Art Project // Take out that unused salad spinner and create this adorable spin art heart for Valentine’s Day. 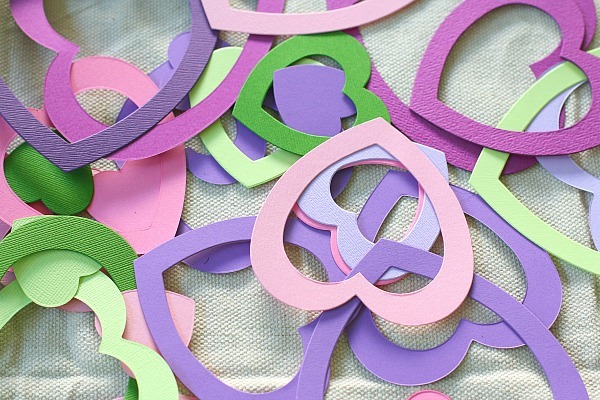 Make several and then string them for an adorable Valentine’s Day banner. 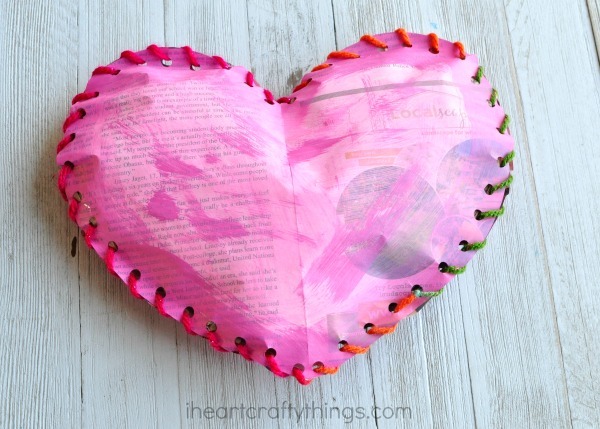 Painted Newspaper Puffy Heart Craft // This is a fun way to use yesterday’s newspaper. Yesterday’s trash can be today’s treasure and this cute little heart craft for kids is a perfect example! Yarn Wrapped Heart // You can turn one of these heart crafts for kids into a one-of-a-kind masterpiece with some cardboard, paint, and yarn! Easy, peasy! 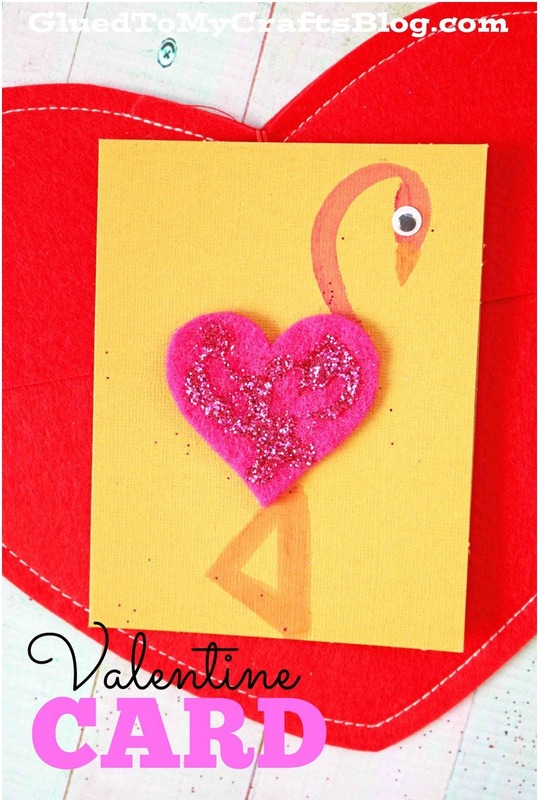 Flamingo Valentine Heart Card // You can turn some wiggly eyes and felt into an adorable little flamingo card perfect for Valentine’s Day. 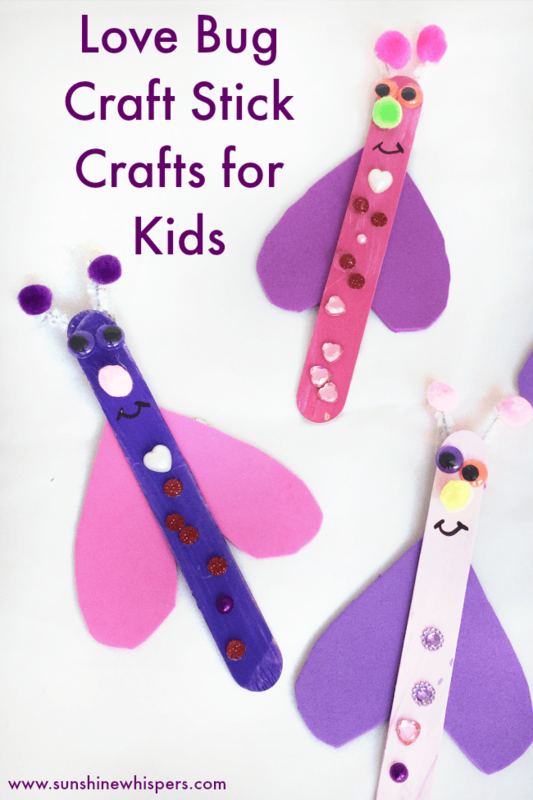 Super Fun Love Bug Craft Stick // There are so many heart crafts for kids to enjoy, but I love the way Sunshine Whispers uses the hearts in this super, adorable craft as the wings for the love bugs. 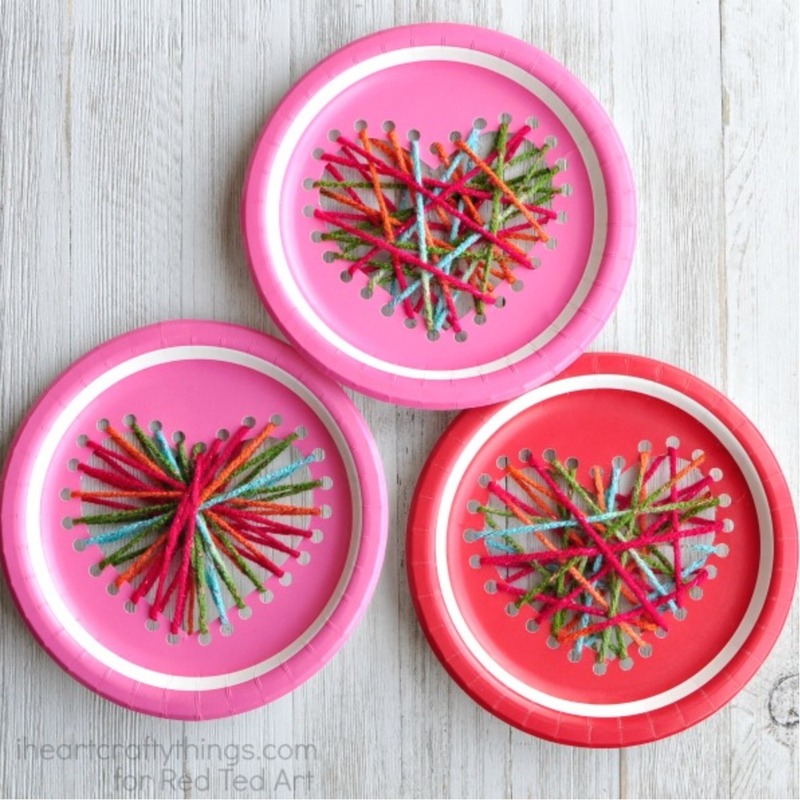 Paper Plate Heart Sewing Craft // Turn a plain paper plate into a beautiful, stringed Valentine’s Day decoration for your home or office. 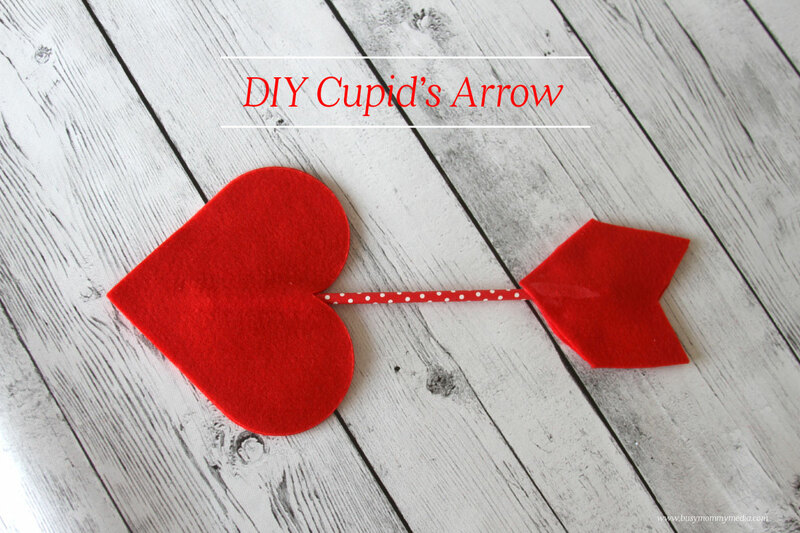 DIY Cupid’s Arrow // I simply adore the simplicity of this heart craft. 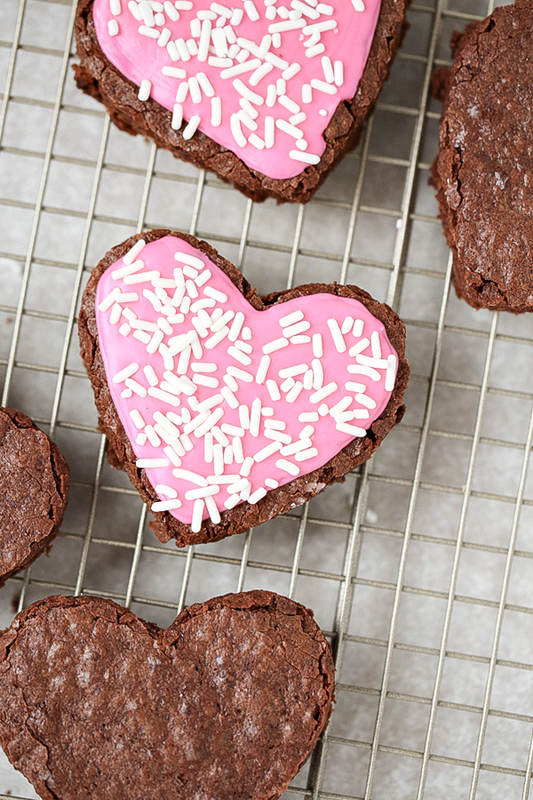 Just by using a patterned paper straw and coordinating felt, you can create such a cute decoration for Valentine’s Day! 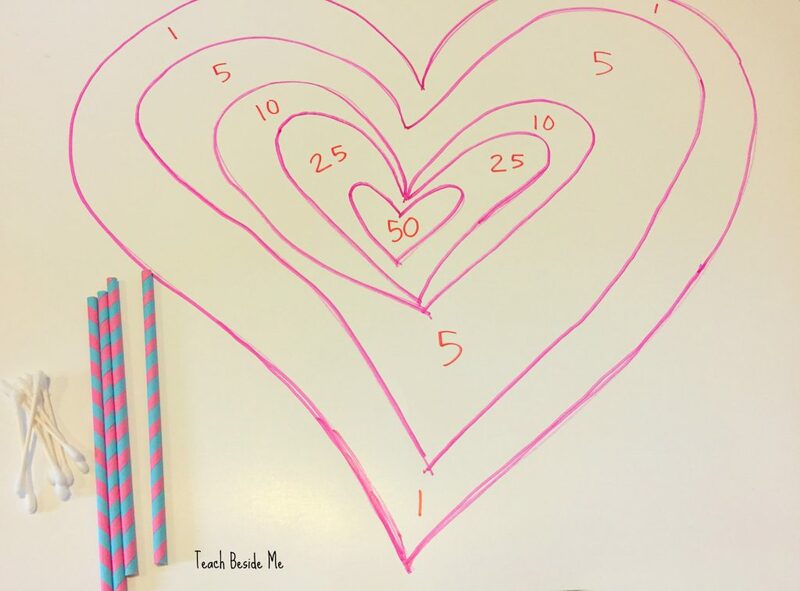 Cupid’s Arrow Heart Valentine’s Math Game // Heart crafts for kids can go beyond just craft time. See how Teach Beside Me turned one in to a fun game. 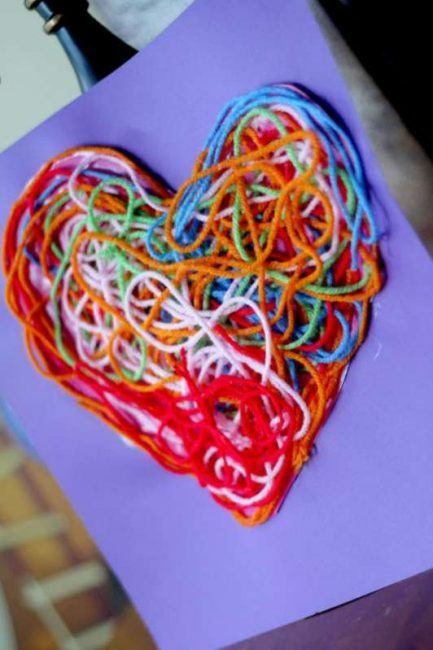 Textured Yarn Heart Craft // There are enough heart crafts for kids to go around and this one is perfect for the younger kids. Because this one doesn’t require a lot of careful attention, it makes it the perfect option for children learning to craft. 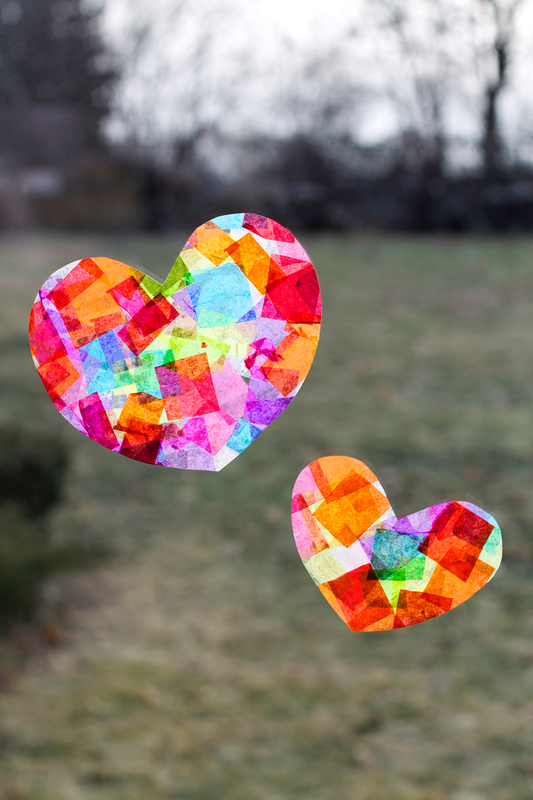 Rainbow Heart Suncatchers // What a perfect way to decorate a window for Valentine’s Day. 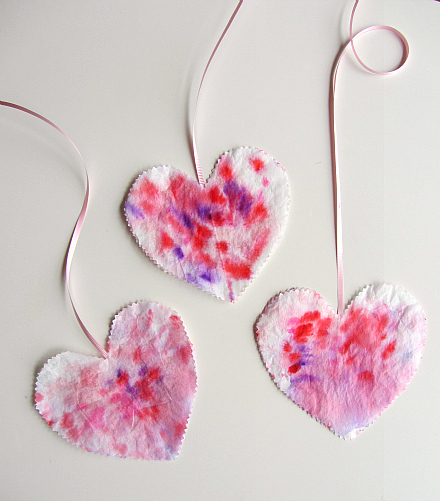 With a little tissue paper and Mod Podge, you can create these adorable hearts! 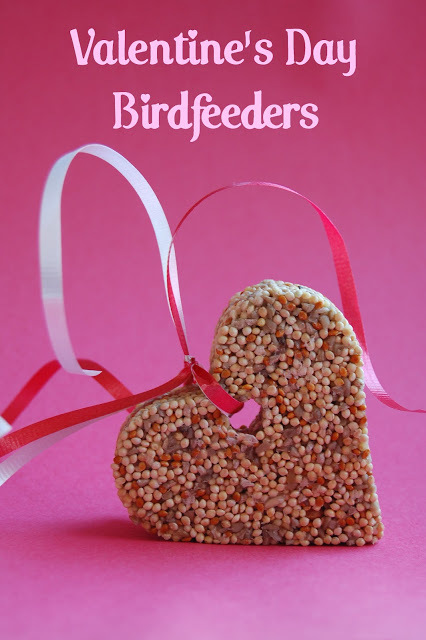 Valentine’s Day Heart Bird Feeder // Even the birds outside deserve some sweet treats for Valentine’s Day. The kids will love watching the birds from the window as they enjoy their easy treat. 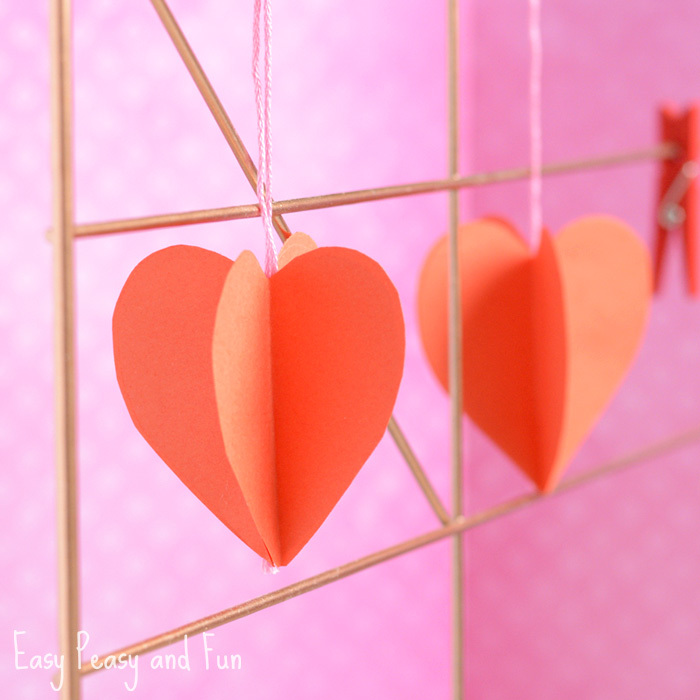 3D Paper Heart Craft // How cute would these 3D hearts look hanging in a doorway or from a curtain rod? Or how about from a Valentine’s Day banner? So cute! 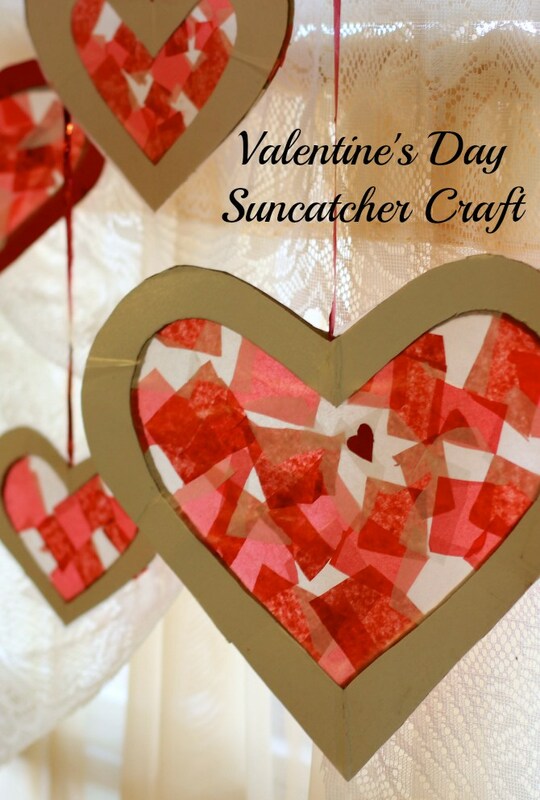 Valentine’s Day Heart Suncatcher Craft // I love the way these suncatchers are framed by a cardboard heart. Hang these on a curtain rod in front of a big window in varying sizes and you have an adorable heart display for Valentine’s Day. 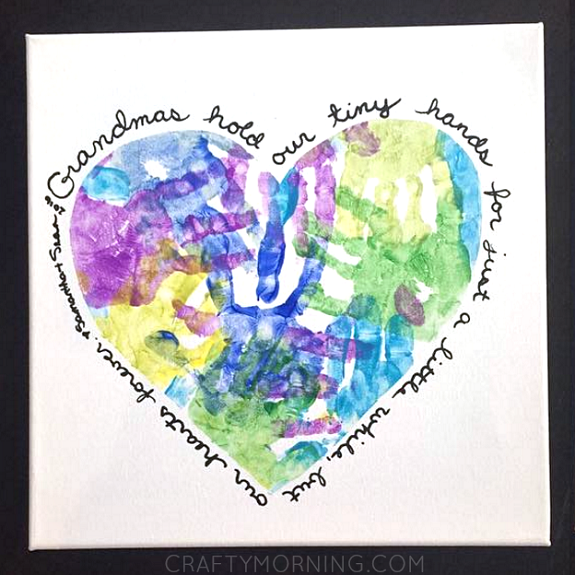 Heart Handprint Canvas for Grandma // Out of all the heart crafts for kids, this one for grandmas is probably one of my favorites. What a great way to honor grandma, right? 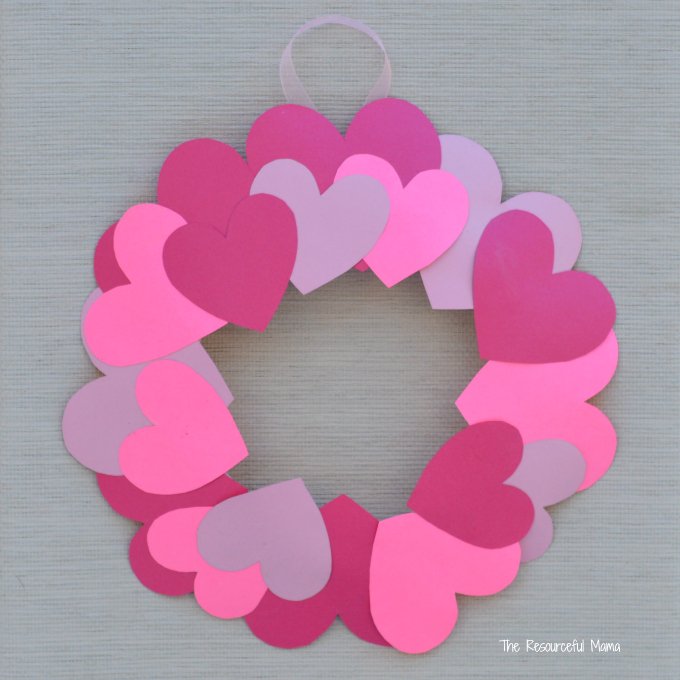 Valentine’s Day Paper Plate Heart Wreath // Forget the overpriced Valentine’s Day wreaths from the craft store! Have your children help you create this adorable little wreath using hearts, paper plate, and a little ribbon. 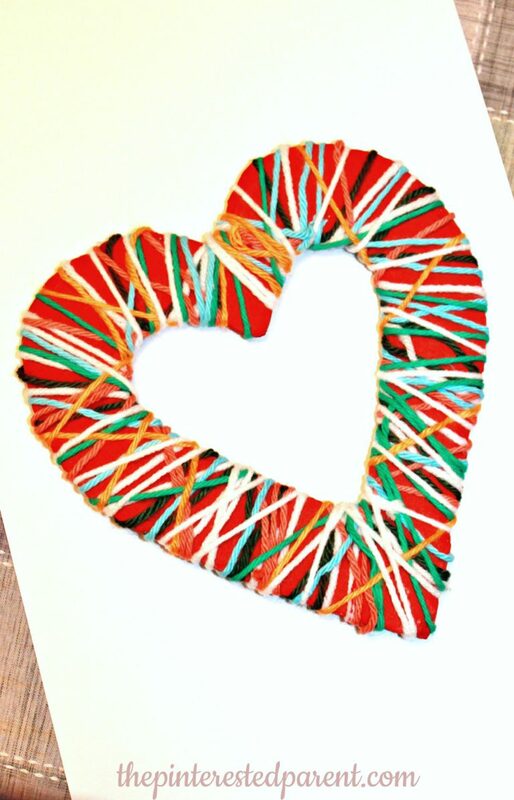 Heart Butterfly Craft for Valentine’s Day // Such a super cute way to use clothes pins. 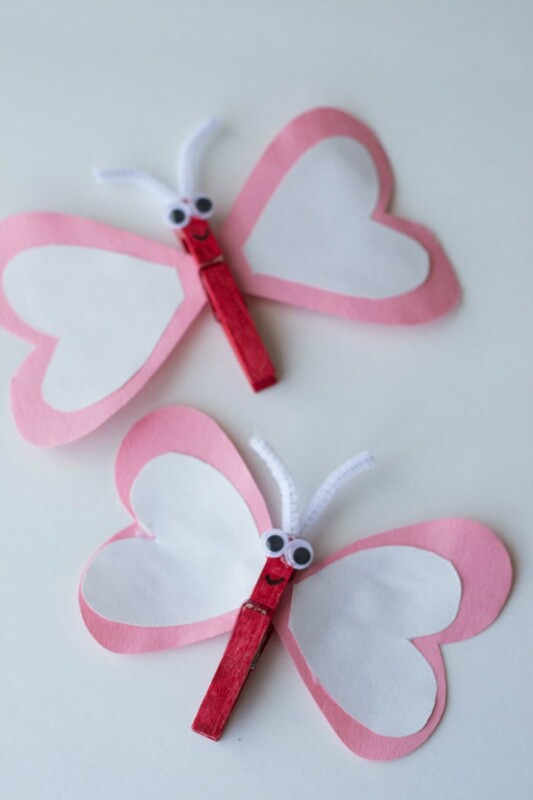 With a little help from construction paper, pipe cleaners, and googly eyes, you can make a cute butterfly for Valentine’s Day. Valentine Craft for Kids: Paper Heart Mobile // A die cut machine (or Silhouette) would make this project a little easier, but it definitely isn’t necessary if you have a pair of scissors. Then with a little help from tape and a piece of string, you can make this adorable little heart mobile. Having heart crafts for kids comes in handy when you have little ones stuck inside because of the snow. If you love crafting with your kids as much as I do, with all these wonderful projects, you’ll have heart crafts for kids for days. These craft are so cute, great for Valentines day! I especially love the butterfly hears, what a cute Idea for my daughter class! I just love so many of these ideas (no pun intended!) and would enjoy creating them along with my kids. I plan to buy the supplies for yarn wrapping this weekend. What a great roundup! My kids love doing crafts and hearts are easy enough for us to handle! These are adorable! These are so gorgeous and exactly what I love to get from my kids. Thank you for this simple, yet pretty idea. So many fun ideas. I know a lot of grandparents and aunts and uncles would love to receive many of these ideas in the mail. Awww these crafts are all so sweet. I really love the paper plate heart sewing craft though. I bet my niece would love making these! So many fun ideas! 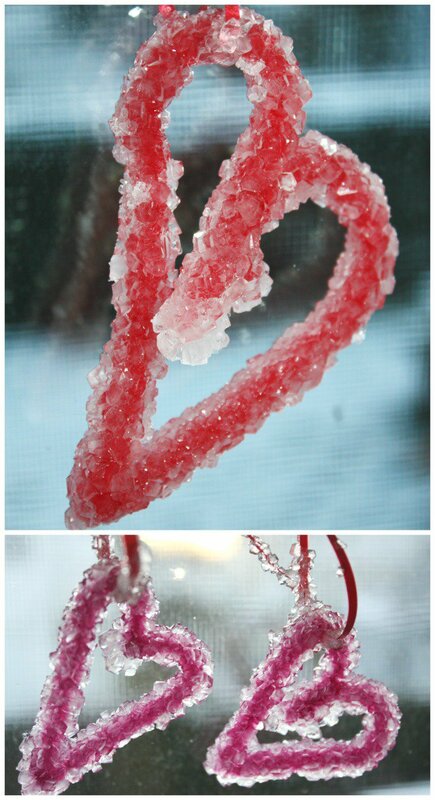 I love valentines day crafts so I will for sure be doing some of these with my kids. Handy to have them all in one place! 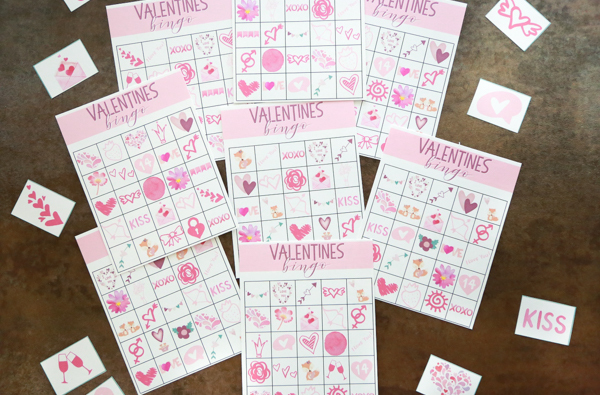 These are really awesome ways to make Valentine’s Card. Thanks for sharing them. I LOVE these!!! 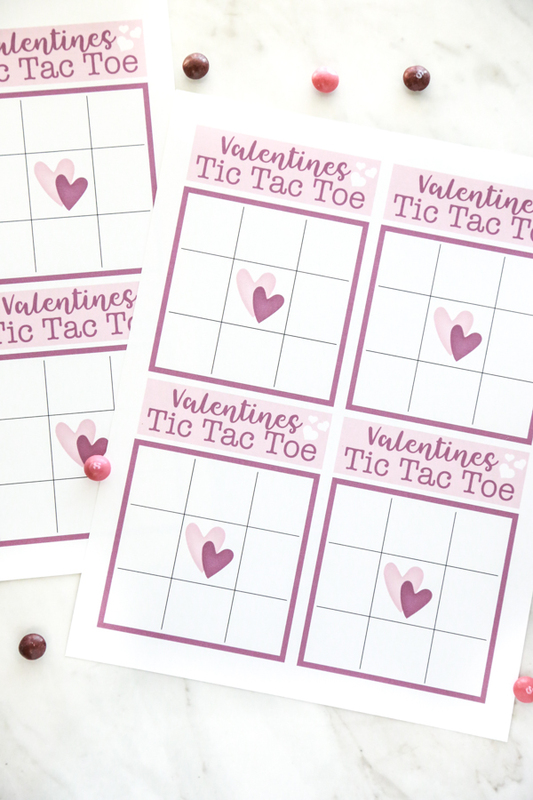 I can’t wait to do the finger print heart this year… maybe we will make a tissue paper bouquet, too! My kids LOVE flowers! I love these. I was looking for something to do in the nursery at church, and these are great! I especially like the tree craft. My little one likes crafts, so we are going to do 1-2 of them. So many great ideas! I love that paper plate sewing craft. I’m going to have to make those with my kids. 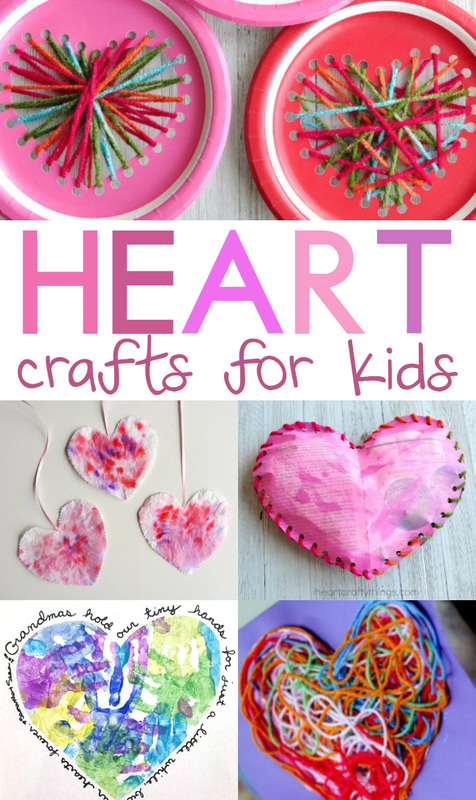 These are all such cute heart crafts for kids, I can’t decide which ones we would rather make first! I knew I shouldn’t have gotten rid of my salad spinner, what a clever way to use it for painting.